The Biggest Advertising Agency New Business Secret - Peter Levitan & Co. The Biggest, Most Important Advertising Agency New Business Secret. I am reposting my LinkedIn October thoughts on advertising agency sales because of Ogilvy & Mather UK ‘s website. They tell it (sell it) like it is. See what I mean about their angle here… it is rare to see an advertising agency, especially a huge one remember that …. An advertising, design, PR agency new business pitch / presentation is a sales pitch. Sounds obvious, right? The problem is that ‘sales’ is a dirty word at some ‘creative’ agencies. If you think that I am overstating this, take a look at a few agency websites, and ask yourself if they are designed to be high-octane sales experiences that drive leads or just well designed agency brochures. A discussion of how to use the science of salesmanship in an agency presentation could fill a book. I’ll be brief and hit what I think are the most effective techniques we can learn from the masters of salesmanship. Allow me a brief detour first. I left advertising in 1995 to put a group of New Jersey newspapers online for Advance Internet (the digital newspaper arm of the Newhouse media group – you know them as the owner of Condé Nast). In addition to inventing New Jersey Online’s digital newspaper editorial persona, we also had to build an early online sales program that included the design of new advertising units and a sales pitch for this new Internet platform. To help me, Advance brought in Jim Hagaman, easily one of the savviest media sales people I had ever met. Within a few days, I had gone from thinking that I knew how to sell (running business development at Saatchi & Saatchi), to jettisoning much that I had learned, to watching a master actually make sales in the nascent Internet marketplace. Much of what you see below came from Jim. One of his more interesting sales insights came when I said that we needed to go pitch New Jersey Online to New York advertising agencies. He said, whoa boy. In his experience, agencies always mucked up the sale. They wanted to put their ownership stamp on the sales message, usually got the details wrong, and always slowed down the process. He said that we were going directly to the clients to explain the benefits of digital media. As I eventually witnessed, he was right. Actually, here is one more super insightful story that will introduce my next point, which I admit might be a “duh” for some of you. You have to understand your client’s mindset, needs, pain points, rationale, and emotional motivations before you can ever craft an effective sales pitch. My point in telling you this story is that I didn’t think through Allen’s motivations before I delivered my early online sales pitch. By the way, he was right. The Internet sure seems like it killed some parts of the golden advertising goose. More advice from the world of sales. Think like the client. The presentation must be written from the client’s perspective. What are they asking for, and what do they need and want to hear? You want to winthem over, not your colleagues. This is the key reason why you have to learn about the individual clients before you ever meet them. Involve them. Don’t make the presentation one-sided. Try to involve the client in a discussion. You might be able to motivate the stone-faced clients by asking them a few questions at the right time. Answer their questions. If the client has specific questions, make sure you answer them and confirm with them that you have. Think all agencies do this? I know for a fact that they don’t. Sometimes in the heat of the pitch, agency presenters will consciously or unconsciously deflect the client’s question so that they can get on with their scripted presentation. This can be a major lost opportunity for dialog and might put off the client. Deliver value. The client has invited you into their world. Return the favor by giving them something of value in return. In most cases, this might be a serious insight or a creative solution. This is your chance to demonstrate why this client couldn’t possibly live without you. Be dynamic. Clients want agencies that are passionate about their work and ideas. Show your passion, and find a way to show passion for the client’s brand and/or quest. You might want to consider actually asking for the job. Jim taught me that leaving the room without a sense of a prospect’s interest and next steps was, hmmm, nuts. Be different. The other agencies that are pitching are good, smart and could probably do the job. You have one chance to look and sound different. Think very hard about how you will stand out from the pack. I suggest that you read a couple of books or blogs on sales techniques. You will benefit from the learning and could get psyched by a sales master’s energy. These are serious sales guys, and they are selling you on their sales pitch. Pay attention. 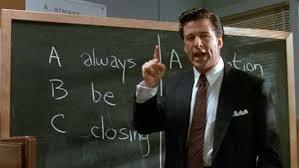 If you need some sight and sound stimulation, revisit Mamet’s Glengarry Glen Ross. Need a line to keep in the back of your head? Watch Alec Baldwin hammer home,“A-B-C. A-Always B-Be C-Closing. Always be closing.” Sure, it’s a 1980’s approach and just might freak out some of your more sensitive colleagues, but the idea of ABC will get those sales juices flowing. Go to Amazon: The Levitan Pitch. Buy This Book. Win More Pitches. This entry was posted in Agency Websites, Marketing, New Business, Smart Agencies and tagged ad agency, marketing, new business, Pitching, website. Bookmark the permalink. Trackbacks are closed, but you can post a comment.